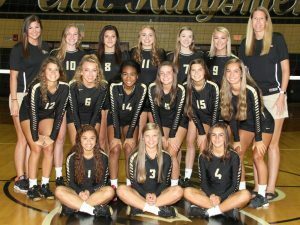 Penn’s Volleyball Team, ranked No. 5 in Indiana, improved to 12-1 with a 25-14, 25-16, 19-25, 25-20 victory against Elkhart Central on Thursday, Aug. 31. Alyssa Torres led the Kingsmen with 12 kills, followed by Italia Fields with 11, Ally Hickey with eight, and Courtney North and Rachel Rupert with seven each. Torres had five blocks in the match. Rachel Hickey had 32 digs, Naomi Willis had 17 digs, Julia Beers and Sophia Cruz had 16 digs each, and Italia Fields and Kylee Hixenbaugh had nine digs each.